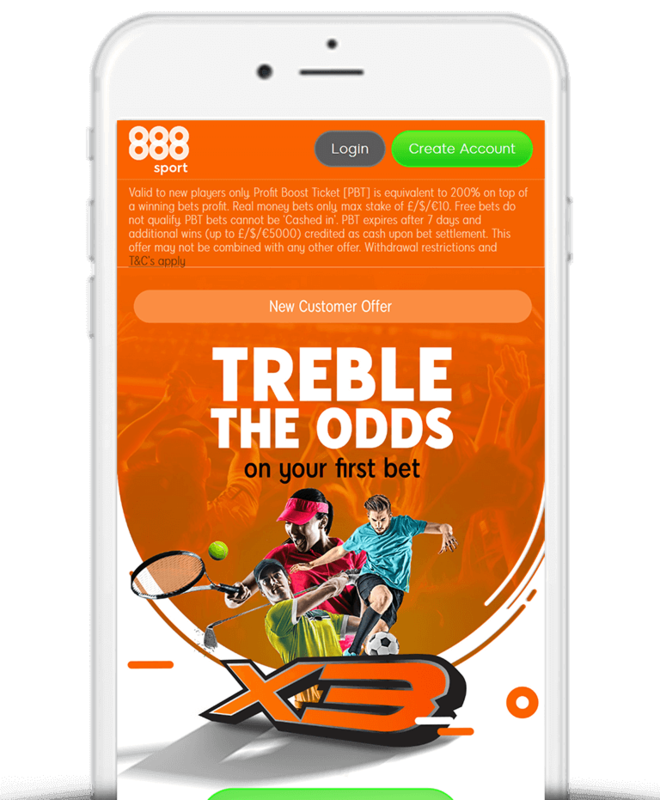 In this article we detail all you need to know about the 888Sport treble odds offer including a step-by-step guide on how to claim the promotion as well as the key terms you should know about. T&C’s apply. In addition to their Bet £10 Get £30 offer, 888Sport have a second introductory promotion that allows you to get treble the odds on your first bet with the company. What Is The 888Sport Treble Odds Offer? Open an account (no promotion code necessary). Deposit and bet £10 or more on any market and apply your ‘Profit Boost’. 888Sport will then treble the odds – with winnings paid in cash! Do note that if you make your first deposit via PayPal, Entropay, Paysafe, Neteller or Skrill then you will not be able to claim this offer. You will however be able to use those methods after your first deposit. Firstly, click here to head to the 888Sport treble odds offer landing page. Create an account (no code needed). Place a £10 bet on any market. 888Sport will then treble the odds with winnings paid in cash. That’s right, we’ve teamed up with 888Sport to offer followers of ThePuntersPage.com a completely free no-strings-attached £10 free bet as well as the customary treble odds offer. To claim simply email your username to [email protected] or DM us on Twitter @ThePuntersPage and we’ll then get back to you as soon as your free bet has been credited. There are a number of terms you should be aware of regarding 888Sport’s treble odds offer. We’ve detailed the main ones below although you can find the full T&C’s on the 888Sport website. Only customers who sign up through the correct link (available above) will qualify for this offer. Qualifying bet must be placed within 90 days of opening an account. Profit Boost Ticket is equivalent to 200% on top of a winning bets profit. Profit Boost Ticket expires after 7 days. Maximum Profit Boost Ticket of £5,000 (or currency equivalent). 888Sport’s treble odds offer really is one of the best in the business. The fact that, unlike many offers, your winnings are paid in cash, further emphasises just how good it is.